TIKI OASIS WEEKEND TICKETS SOLD WITHIN MINUTES OF RELEASE! However – the Marketplace, Art Show, and Car Show are all Open to the Public! Tiki Oasis is the crossroads of the Tiki world. Craftsmen, artists, tinkerers, and traders haul their wares to Tiki Oasis creating an Exotica emporium unmatched throughout the world. Many vendors create limited edition items specifically for the Tiki Oasis weekend shoppers. The marketplace also features DJs and live music! Marketplace vendor listing below. Join us for our 8th annual art show at Tiki Oasis featuring all original artwork. 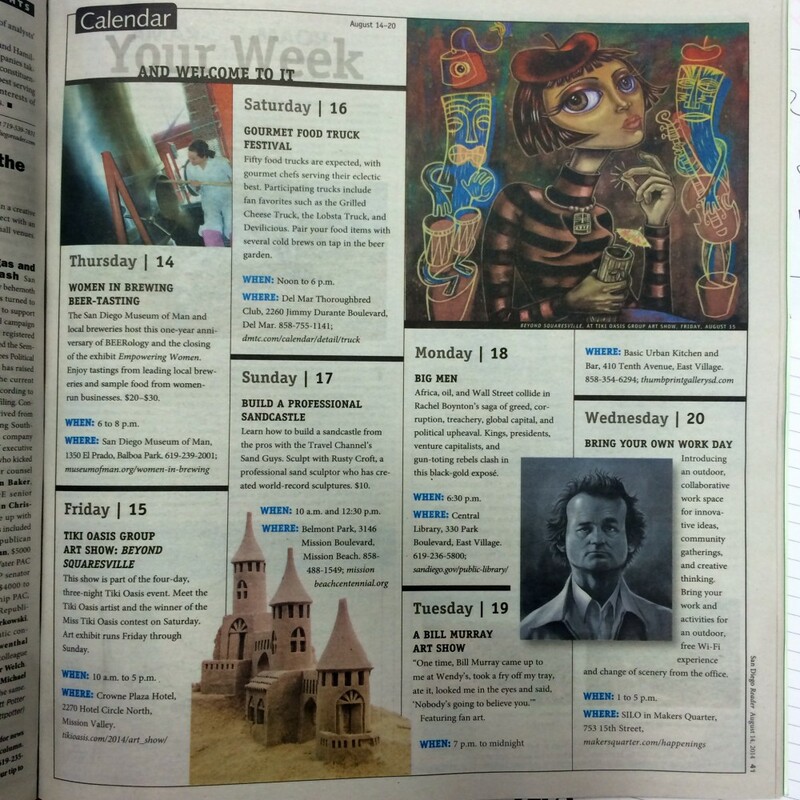 Curated by Tiki Oasis co-producer Baby Doe Stroheim, this art show will be open to the public all weekend long! ARTIST LIST AND PREVIEWS COMING SOON! Artist Reception: TBA – stay tuned! listen to DJs and live music! ENTERTAINMENT AND AUTO LIST COMING SOON! Wide range of apparel for women and men inspired by travel and fashion. Original artwork, mugs and pendants. Paintings, Tiki Art, Dolls and More! Official Tiki Oasis vendor for Tiki Oasis T-shirts and Posters! An assortment of rockabilly, exotica, surf, instrumentals and garage on vinyl and CD. Throughout the weekend you can also find numerous Tiki Oasis performers selling their releases directly to their fans in the Dionysus booth. Wheelin’ and dealin’ vintage clothing, costume jewelry and vintage treasures from Missouri! Handmade Metal Pendants, Belt Buckles, Mugs and Much More! Unique handmade ceramic designs that will enhance your tiki lounge and art collection. 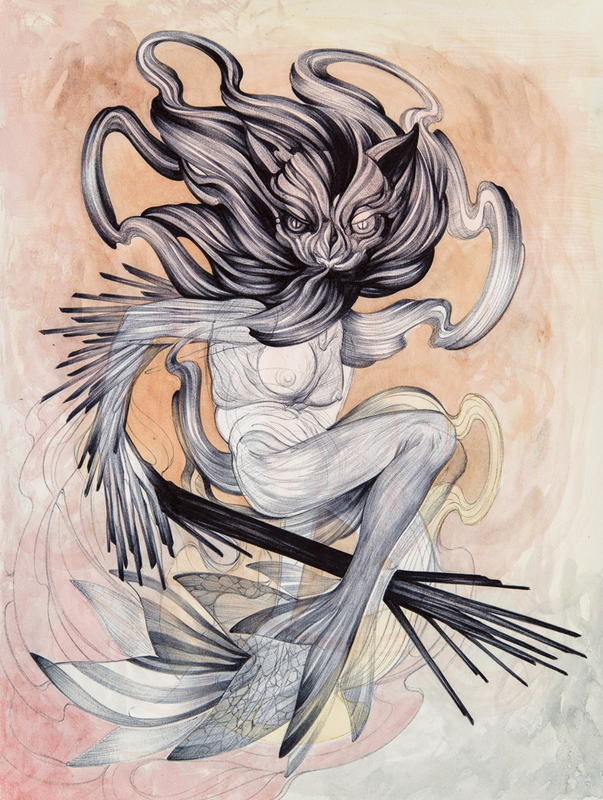 Paintings and drawings by Ken Ruzic. Polynesia Vintage Hawaiiana, Tiki, surf and beach. Original Novelty Prints by Denialle Von Fitch. Novelty print apparel for Mid Century Modern connoisseurs. Cool vintage audio, video, and vinyl of lounge, exotica, bachelor pad, surf, hot rod, garage, rockabilly, hot guitar and more! Stickers, T-shirts, posters, prints and original paintings by our artists Shag, Aaron Marshall, Von Franco, and more! Custom made in the USA – Tiki attire for men and woman. Hand-carved coconut palm Tikis, masks, torches and more! Original art and limited edition prints and tiki mugs. Vintage Aloha wear including a huge selection of vintage Aloha shirts! Whimsical exotic isle paintings, limited edition Tiki Mugs, hanging driftwood tiki birds, carved Tiki signs, and handmade mugs as well as $5 ceramic Tiki necklaces! Reproduction Hawaiian Tiki dresses brilliantly colored with tropical & floral patterns. Tiki Oasis 16 Marketplace and Car Show! Though the four-day weekend tickets are sold out, there are free and open to the public events such as the Tiki Oasis 16 Marketplace, Car Show, and Art Show! There will be some tickets available at the door for the Sunday Night closing party. Tiki Oasis is the crossroads of the Tiki world. Craftsmen, artists, tinkerers, and traders haul their wares to Tiki Oasis creating an Exotica emporium unmatched throughout the world. Many vendors create limited edition items specifically for the Tiki Oasis weekend shoppers. You can also find new and vintage clothing, vinyl records, house furniture and accoutrements, and much more! Note: Grand Pacific open until 9PM! The Marketplace is open to the public on Saturday and Sunday! Crowne Plaza, Hotel Circle, San Diego, CA. Free, open to the public, all ages! Meet the Tiki Oasis Artists and the 2016 Winner of the Miss Tiki Oasis Pageant! Tiki Oasis 13 event in San Diego, California at the Crowne Plaza Hotel and the Bali Hai Hotel. Hulabilly theme. Hawaiian. Cowboy. Tiki Oasis 16 Marketplace Vendor List! Though weekend tickets to Tiki Oasis are sold out, the Tiki Oasis 16: Party on Monster Island Art Show, dedicated to this year’s Tiki Oasis theme “Party on Monster Island” is open to the public! The show includes some of your favorite artists from previous Tiki Oasis art shows, and a few newcomers! Tiki Oasis 16: Party on Monster Island Tickets Going Fast! TIKI OASIS 16: PARTY ON MONSTER ISLAND! Tiki Oasis is the largest and longest-running festival in the world for lovers of Island lifestyle and purveyors of Polynesian Pop. The event runs four nights and three days. Daytime events include DJ’s,a marketplace with 100+ vendors, educational seminars, car show, and tropical cocktails by the pool. In the evening enjoy the main stage bands and a midnight burlesque show. Each year the event has a theme – this year it is Party on Monster Island! EVENT TICKETS ARE ALMOST SOLD OUT! Don’t miss this monster event – get tickets at this link before they are gone! Evening entertainment headliners include The Sonics, Donna Loren, The Woggles, The Alika Lyman Group (Hawaii), Phantom Four (Netherlands), The Messer Chups (Russia). A compete rundown of Tiki Oasis 16 Music and Mayhem can be found at this link. PUT SOME MONSTER ISLAND ON YOUR FACEBOOK AND INSTAGRAM! WANT TO BE A TIKI OASIS VOLUNTEER? Tiki Oasis has many volunteer positions available as well as paid positions. Volunteers receive a Thursday-Saturday pass to the event in exchange for about 8 hours of volunteer fun-work. More information at this link. HAVE A PRODUCT OR SERVICE OF INTEREST TO THE TIKI OASIS CROWD? Tiki Oasis offers a wide variety of opportunities for your organization to be featured at the event! Click here for more information. A crispy cool scorpion bowl in the glow of a Mondrian glass wall with crazy hep beats softly lulling in the background? Don’t mind if I do! If that sounds like a dream, keep reading! The Cat Eye Club is a retro cocktail lounge & tiki bar located in Downtown San Diego in the heart of East Village across from Petco Park. Cat Eye Club is inspired by the late 50’s, early 60’s nightlife culture. It pays homage to mid-century cocktail trends with an emphasis on classic and tiki cocktails. From rubber Godzillas tearing apart the South Seas to surfin’, Go Go dancing Frankenstein and Wolfman, creatures have always been lurking in paradise. This year Tiki Oasis celebrates our monster brethren from King Kong (1939), Godzilla and Creature From the Black Lagoon (1954) to the famous monsters of Hollywood (1932-1950s). Like lovers of Polynesian Pop, many of the classic monsters we know share the Modern Primitive ethos. Some were discovered in mysterious, exotic, tropical lands but others originated in urban areas and frolicked with average humans. 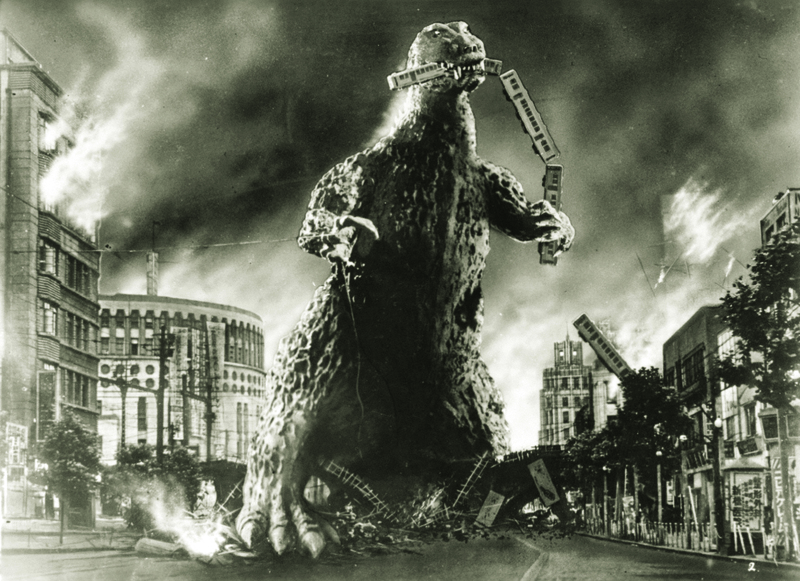 While Godzilla loved to visit major metropolis’ like Tokyo he lives on and originates from Monster Island. 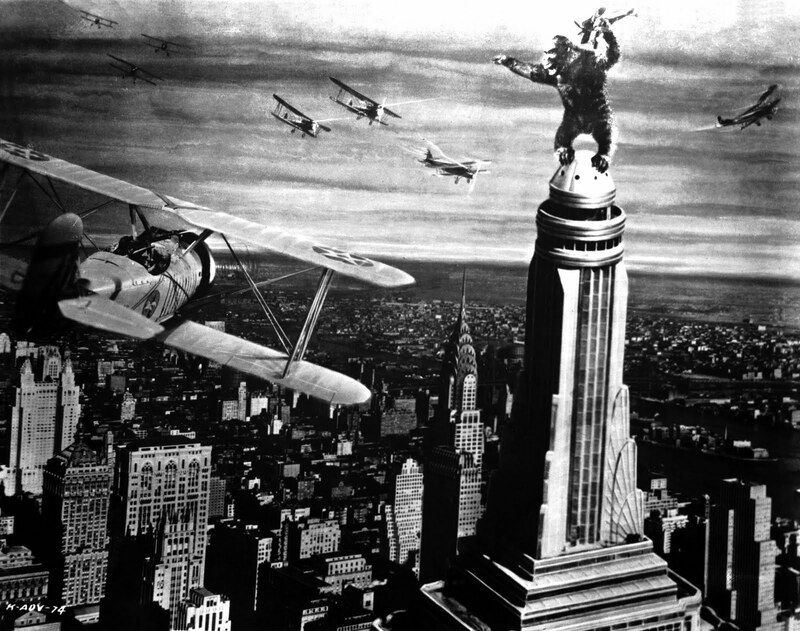 The original king of the jungle King Kong was a modern primitive and could be seen cavorting on major architectural landmarks when he wasn’t picking up on chicks in his hometown. 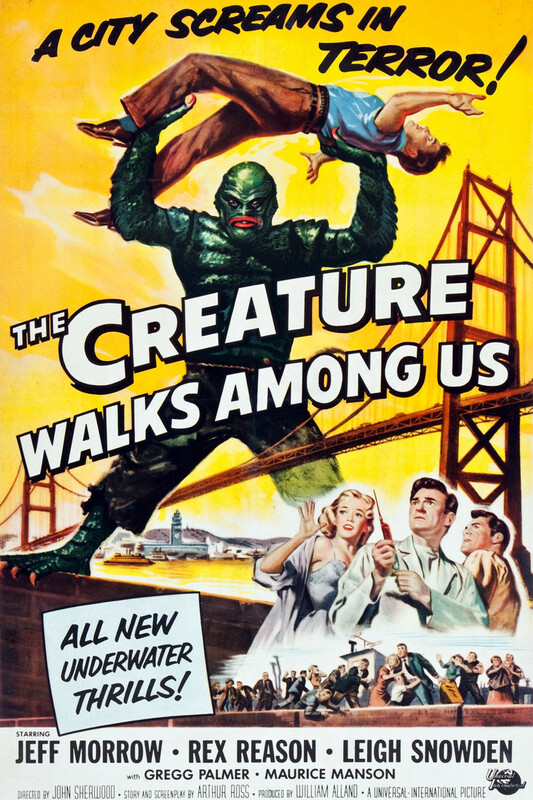 Even the Creature from the Black Lagoon left the Amazon and visited the US. 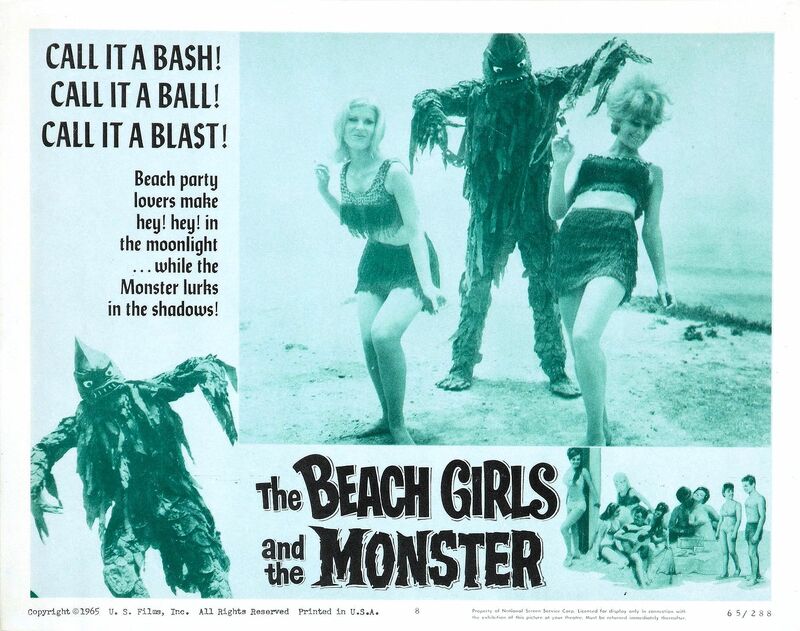 The classic city monsters made famous in films (The Mummy, Frankenstien, Dracula, Wolfman, The Invisible Man) later got hip to the times and joined the beach/dance party scene. Not only did monsters leave their remote islands and come to the beaches, the Hollywood monster crowd threw their own shindig. Don your rubber mask and join the monster party at Tiki Oasis 2016! 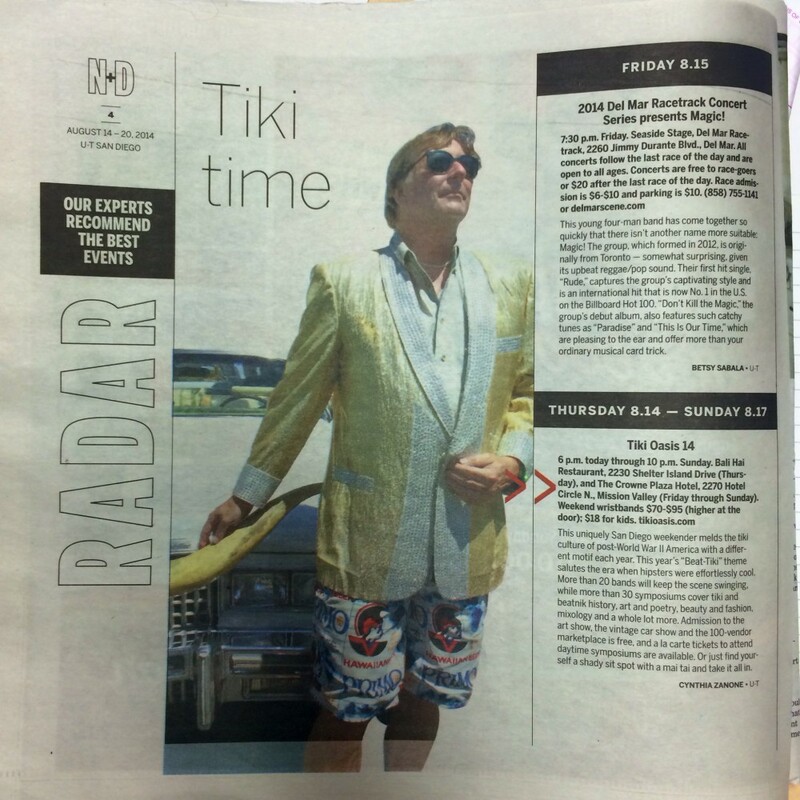 Tiki Oasis 15: Spotlight on Mixology and Party Symposiums! Tiki Oasis is a four-day Polynesian Pop lifestyle convention / party which takes place in Southern California each August, and is the only event of its’ kind on the West Coast. Each year Tiki Oasis presents a different theme which explores, celebrates, and preserves mid-century aesthetics via entertainment, fashion, food, drink and education, while showing its’ relevancy in contemporary culture. Tiki Oasis attendees experience four days of mixology, live and dj music sets, educational symposiums, book signings, marketplace shopping, art, burlesque, comedy, vintage cars, fashion, food, kids events, and more! Each year the event takes on a unique theme. This year’s Tiki Oasis theme is “Yesterdays Future Today”. The Space Age ran parallel to the Modern Primitivism of Tiki Culture. While technology propelled modern man to the moon, the common man celebrated isolated islander cultures that were equally unattainable. Grab your tiki mug and let’s BLAST OFF!!! 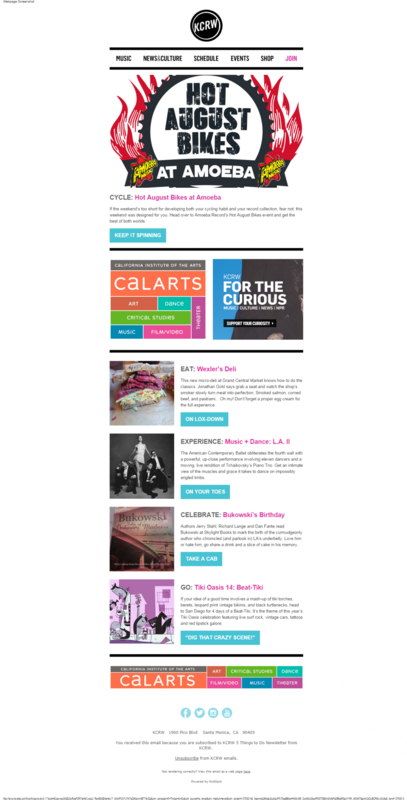 Spotlight on Educational Mixology and Party Symposiums! Attendees: MUST be 21 years and older to attend. Entry included with the Deluxe Cocktail wristband. Home bartenders, space cadets, and cocktail-crazy tikiphiles will all enjoy this interactive symposium that is one part molecular mixology, one part basic science, and all cocktail quaffing fun! Join Ram Udwin of Boy Drinks World as he guides you on a spirited scientific journey that will blast your tiki drink game into outer space with modern techniques and culinary flavors. During the symposium, attendees will enjoy a hands-on learning experience in applying space age techniques to tiki cocktails, with the opportunity to sample a selection of cocktails created in class. Ram Udwin is the founder and creative mind behind Boy Drinks World, maker of fine cocktail bitters, tinctures, and other delightful things. Attendees: MUST be 21 years and older to attend. Entry is included with ONLY Cocktail wristbands. Everything about rum is wrong: it wasn’t invented where or when popular histories claim, and the most famous sea chantey about it was invented by a novelist, not a pirate. The truth is more interesting: rum helped spark the American Revolution, was currency in Australia, entered 18th Century medical cabinets as a health tonic, and is still a sacramental offering among voodoo worshippers. Rum made sea voyages bearable in the 1850’s and tikis fashionable in the 1950’s, and it once fueled the economy of half the world. Attendees: Entry is included with BOTH Deluxe Cocktail and Deluxe wristbands. You’re T minus sixty minutes from planning the mid-century space age party of your dreams! From Project Mercury to Teenagers From Outer Space, whether you pilot a swinging bachelor pad or a swank couple’s escape pod, we’ll provide inspiration, recipes and tips that will send your celebrations straight into the Milky Way! UPDATE: THIS SYMPOSIUM HAS SOLD OUT! A History of Merchant Bottlers & Private Labels That is Tastier than it Sounds. Explore the history of the rum trade through the fascinating stories of the merchants and brokers who helped bring interesting rums to the taverns of Europe and America. This centuries-old tradition continues to this day with modern brands taking on the role of offering unique and rare rums to consumers, often with unique cask finishes and creative blends. You’ll taste rare rums that illustrate both the role of the merchant bottler as well as the vast diversity of rums that are in the market today. Prepare for a sumptuous and flavorful journey into some of the best rums you’ll ever have! Sponsored by Old Harbor Distilling Co.
Orbit the Tiki Oasis 15 Vendor Markeplace! Prepare your retro-rockets to orbit over 100 out-of-this-world vendors selling hand-crafted Tiki art, vintage clothing, trinkets and more! Tiki Oasis 15 Marketplace is FREE and open to the public unless noted otherwise! Friday August 14th – Sunday 16th Only! 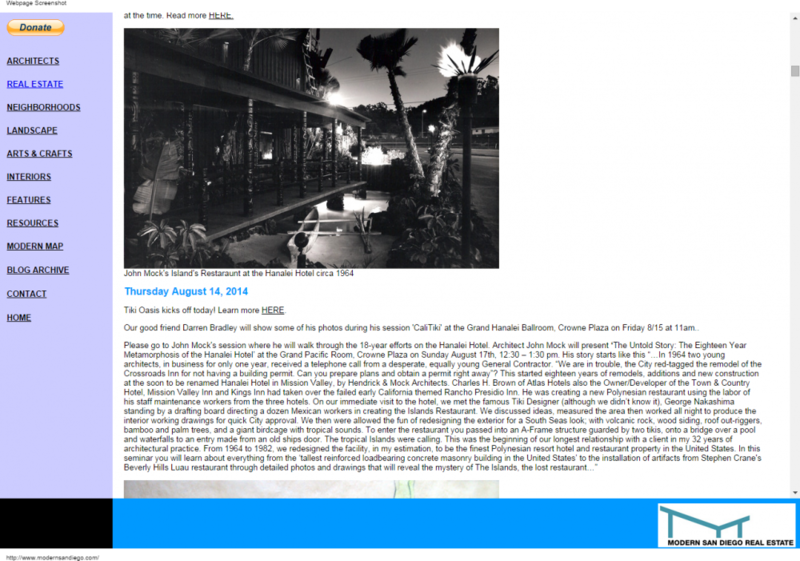 8/13-15: Tiki Oasis 15 – YESTERDAY’S FUTURE, TODAY! Super Interstellar Saturday headlining act will be revealed on June 1! The Space Age ran parallel to the Modern Primitivism of Tiki Culture. While technology propelled modern man to the moon, the common man celebrated isolated islander cultures that were equally unattainable. Whether it was a World’s Fair or Disneyland’s Tomorrowland (1955), It seemed that the interest in other worlds in outer space was equally as intriguing as our curiosity of primitive cultures. All World’s Fairs had “International” exhibits displaying Exotic and Primitive cultures alongside the most modern aspects of technology. Similarly, with a short walk across Disnelyland’s Main Street, tourists traveled from the advanced technologies of Tomorrowland to the wilds of Adventureland’s Polynesian garden – The Tiki Room and the Jungle Cruise. In 1947 the world listened and read about the Kon Tiki raft sailing across the South Pacific toward the most remote island on earth – Easter Island. Ten years later the Western world watched as Russia’s Sputnik sailed into outer space to begin The Space Race. Soon thereafter Apollo jettisoned the first men to the moon. The Telstar satellite (1962) inspired Joe Meek to pen the #1 Surf instrumental tune of the same name using cutting edge recording techniques (the single was backed by B Side “Jungle Fever”). To ensure a safe voyage we have have assembled a stellar crew of Space Cadets to lead you on your journey to the stars: Flight Engineer Danny Biederman; Command Pilot Don Preston; Mission Specialist Neil Norman; Educator Mission Specialists Duke Weiss and Jeff Chenault; Space Flight Participants Sven Kirsten, Richard Foss, Martin Cate, Will the Thrill, and Domenic Priore. In 2015, we here at Tiki Oasis will take you on warp speed from the garage-rock primitivism of The Chocolate Watchband and the vintage style Exotica of Tikiyaki Orchestra to the Blast Off Rock from Earth’s capitol’s house band The Phenomenauts. New Deadhead Rum packaging launched earlier this month using artists’ submissions of their interpretation of a tsantsa—the shrunken head of an enemy kept as a trophy.­ The new bottle features a large scar on the back where the brain would have been extracted, designed by the artist Q; several windows to show the rum level (“the drink-o-meter”), created by Jason Janes (aka 3Sheets); a heavier brow, pinned ears and the brand’s name embossed across the forehead, crafted Rodney McLellan (aka Odd Rodney). You will without a doubt want to take a bottle home as a trophy for yourself. Exquisite molasses-coffee silkiness on the mouth, deepened by a hint of black pepper, turmeric and orange cloves. Sumptuous yet light-hearted, there’s no burn or bitterness. The cedar and exotic barrel influence is apparent through a burnt brown sugar, cinnamon, allspice and toffee backdrop. My name is Zippy Moondog and I love Hawaiian Shirts. For 15 years I have shared my passion for aloha-wear from my shop ‘Hula Girl’ on the beautiful island of Kauai. I recently launched the Web site ‘Hawaiian Shirt Dude‘ so I could spread aloha to the rest of the world, and the response has been amazing. I’m making new friends worldwide and making the world a better place one shirt at a time. This will be my first Tiki Oasis and I look forward to meeting all of you! 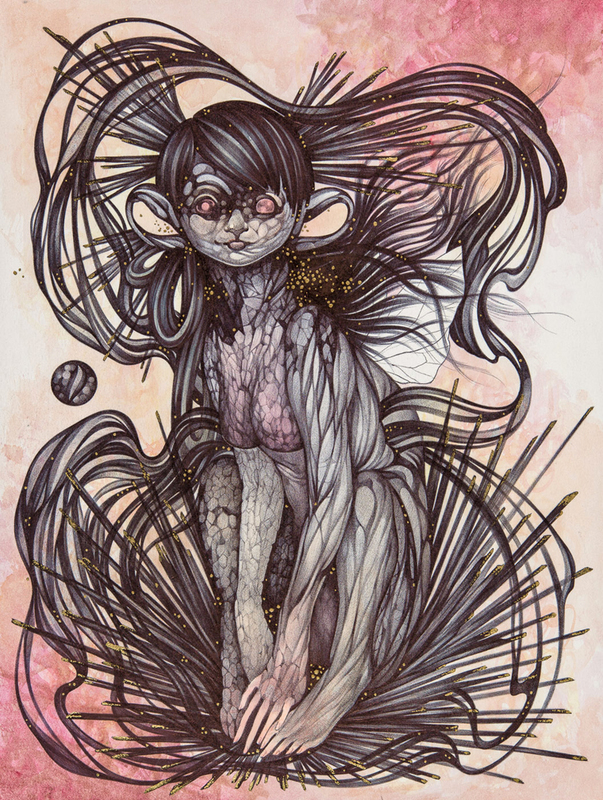 Xupuy, who released a hardcover collection of her sketchbook work last year. She’s since apprenticed as a tattooist and created a labyrinthine body of work that utilizes the colors and totems of that profession in a way that only Katherine could.While huge fans of both bodies of work, the sketches really won the crew at La Luz de Jesus over and they offered her the opportunity to expand upon the themes present in her book (which she’ll be signing at the opening reception). Read an interview with Katherine Brannock by Lisa Derrick in March of 2014 while the Laluzapalooza show was up.